t*rexes and tiaras: Friday Favourites 177.. This week has been odd, as I'm officially allowed to buy things, but I totally haven't. I'm not sure why. Well, I've bought myself a new pair of leggings for the gym, and then have ordered some things for upcoming birthday presents. And actually I'm quite excited by the leggings. But I wouldn't put them in the same category of frivolous purchases as I would this week's wishlist..
001: The Dotty dress from Voodoo Vixen is currently topping my dress wishlist. I think this is mixture of mint green and red ladybirds and detailing is just perfect for spring. If it ever happens. 002: Vendula London never seem to miss when it comes to creating cute bag designs. Their new range is based on sushi stores and features these cute kittens! 003: These Irregular Choice Yankee Doodle shoes are currently in the sale, Temptation. 004: I'm enjoying all of the colourful pieces in the Whitepepper sale as well. I've always been a great fan of dungarees and this jumpsuit is just perfect with it's cute pocket detail. 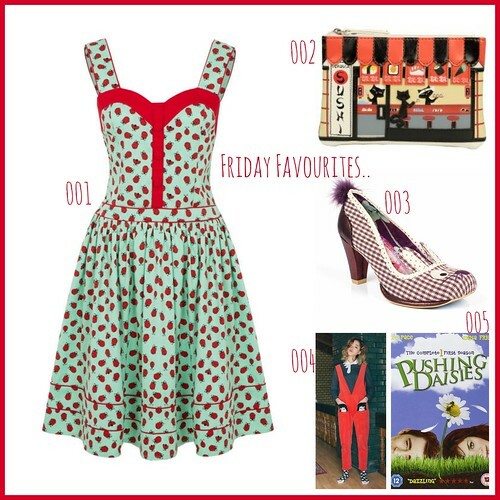 I loved Pushing Daisies and yes yes yes, you'll love the outfits!!! It's one which keeps being recommended to me. I have some Amazon vouchers on the way from a survey site I work with, so I'm thinking perhaps I'll put them towards the box set. I really love halter dresses, too. I was eyeing some of the bags in The Whitepepper sale y'day. I've had those Yankee Doodle on my wishlist since they came out....never had pennies for them though! I know, I'm desperately hoping to take on another dress commission before they sell out.